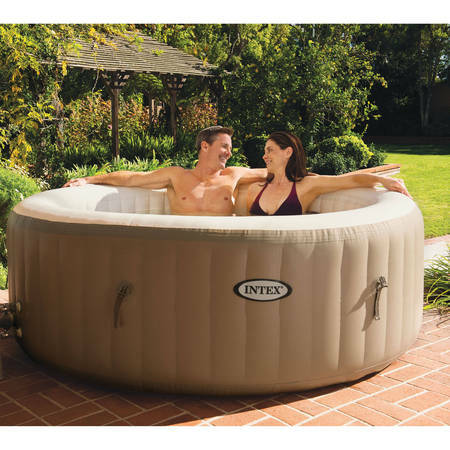 Get cozy, relax, and indulge yourself in the Intex PureSpa Bubble Therapy Inflatable Spa. With the touch of a button, adjust the temperature to best suit your comfort level. It is comfortable enough for 4 people and the durable Fiber Tech Construction, including 48 Fiber Tech beams, are strong enough to support someone sitting on the side. 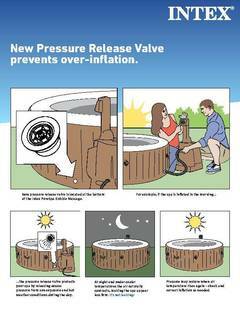 This portable hot tub holds 210 gallons of water, has a temperature range of 68 to 104 degrees, and requires only simple maintenance with 2 easy to replace filter cartridges for clean refreshing spa water. The built in hard water treatment system makes water gentler on skin for an even more soothing experience. Treat yourself to a bubbly massage or just relax after a long day in this Intex PureSpa Bubble Therapy Inflatable Spa. WOW!! What a great find . . . $399.00 + $2.97 shipping + tax for the bargain price of $426.00 . . . and now we have a hot tub on our deck! We had wanted one, were not sure how often we would utilize it, and did not want to spend a fortune! This was a fantastic solution! The quality of this Intex Hydro Spa is excellent! Set-up was a breeze; my husband and I did it all in about an hour! Took about an hour to fill with the hose. The water was initially 74 degrees and heated to 100 degrees by the next morning- which is what we set for! WOW!! The jets are super strong! I still cannot believe the cost was so inexpensive! What a great find! Thanks Walmart.com! 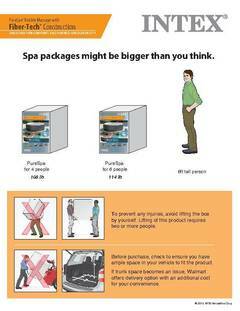 Great spa not just for the price but more than a great product. I went to utube on the set up and was done in 30 minutes. I would recommend this to everyone. Having trouble finding filters so I improvised and cut one to size why I clean the original ones if there is a bad side it is playing with the chemicals but I must have the right touch because the water is still clear and now foam free. Great hot tub for the price!!! Easy to set up free delivery! This was the best gift my husband could ever get me. I have chronic back problems and I have to say this has helped tremendously. Easy set up and in 24 hours your ready to be in your Jacuzzi. Make sure you buy the proper chemicals to make sure you it is safe. The highest temperature it goes is 104 degrees which is perfect. I would definately recommend this product to anyone. Are you able to sit on the side, around the top? 2. Yes, but I wouldn't sit there for long. You can more or less Lean/sit. 4. I wouldn't unless you are a really small person. The sides are strong, but I don't think it would be good to SIT on them. If you slipped and accidently fell on the side I don't believe it would bend or hurt it. Hope this helps. 8. Depending on your weight yes we do and were around 120 to 145 lbs. 9. Yes, the top edge has a weight capacity of approx. 154 lbs. Have a great day. 1. It is possible to install and leave the spa outside at a temperature not lower than 39 degrees Fahrenheit provided the water temperature inside the spa is higher than 39 degrees Fahrenheit and the water inside the circulation system, pump, pipe are not frozen. 2. No, the product is not recommended to be used during the winter months. 4. nope...take indoors from 10/15 to 4/15 ! 5. I really can't answer that . Arizona is always warm , but as long as you keep the heater on I don't see why not. 6. The temperature low point is 39 degrees. 9. i plan on trying it out in the NY winter, bought a pop up gazebo with walls, bought a solar cover and will keep the cover that comes with it on and get some 2 inch styrofoam to build a box around the heater unit, i am pretty sure it will keep it working, also we keep the temp at 103. Do u need a pump? 2. no... comes with everything! 4. The spa comes equipped with a built-in pump. You do not need to purchase a separate pump. Have a great day. 5. No, it come with one. Keep the receipt, it may break like mine. 7. It comes with a filtration system. 9. No additional pump needed. It comes with the spa. The pump is the air pump plus the filter pump used to clean out the spa. It easy to connect together. Inflates in a minute or two, fills quickly and 36-48 hours to fully heat to104 with cold water filling it.